The Satellite Status Report is a quick way to check basic stats on a remote Satellite Monitoring Service. Like many reports, there is a timestamp showing the report generation time in the upper right, along with buttons to take you to the table of contents, and to generate a PDF of the report. Below the report header is a row of boxes giving quick counts of servers and monitors that are run by that particular Satellite Monitoring Service, and their status. The blue Satellite Details box gives information about the Satellite, it's status, remote (at the remote site) computer name and IP address, etc. Below the Satellite Details box will be a group of colored boxes, where each colored box represents a computer being monitored by this Satellite. 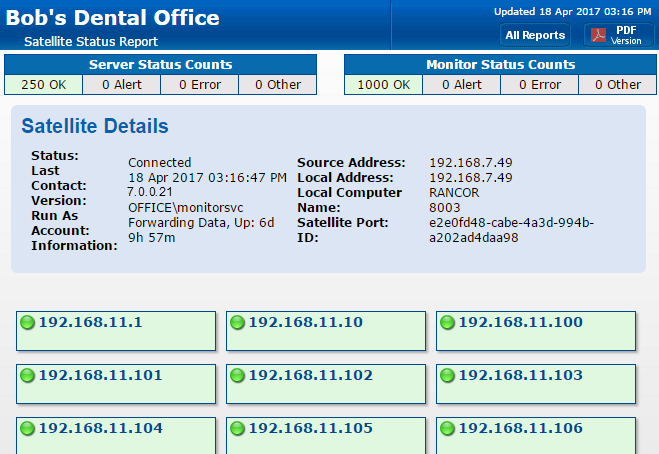 This group of boxes is show the individual servers' status and operates just like the All Servers Report. If the Satellite still needs to be accepted, a large yellow box will indicate that status and give instruction on how to accomplish that task.